Prominent & Leading Authorized Wholesale Dealer from Hyderabad, we offer hand operated overhead travelling cranes, electrical overhead cranes and goliath gantry crane. We are instrumental in wholesaling and trading Hand Operated Overhead Travelling Cranes, which provide with ultimate solutions for carrying heavy loads in mines, fisheries and construction sites. These products have been made by employing cutting edge technology machineries. They can be operated manually and are exceptional in tensile strength. We are among the distinguished names in the industry for wholesaling and trading Electrical Overhead Cranes, which have earned us a huge clientele across the country. These cranes are widely used at civil engineering sites and mines for lifting of heavy loads comfortably. 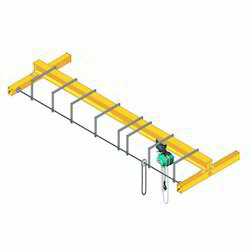 They provide with smooth operation of the over head pulley and are user friendly as well. We are known for timely delivery of orders, owing to our transportation network. We are a trusted name in the industry for wholesaling and trading Goliath Gantry Crane. 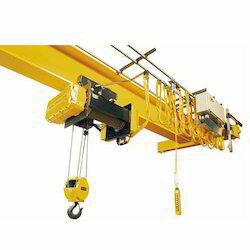 The offered crane is extensively used in carrying heavy loads in coal mines, construction industries and fisheries. They are equipped with over load protection and thermal protection for preventing the motor from getting heated. Being supplied with an in built emergency switch, it is extremely safe to use and can be stopped abruptly when required.